Families are welcome to make an appointment to visit the centre and complete a waiting list form. During the visit you will be able to meet the Co-ordinator, view the playrooms and ask any questions regarding care arrangements. 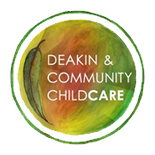 Priority is given to staff and students of Deakin University in accordance with the guidelines set down by the Department of Education & Early Childhood Development. It is recommended to register 12 months prior to care being required. When a vacancy arises, parents will be contacted and invited to visit the centre to confirm a place. During the visit parents will be given all appropriate paperwork to complete and orientation visits will be organised. We believe orienetation is an invaluable part of welcoming familes to our service. We believe orientation is a very valuable process for parents and children. We work closely with each family to help both parents and children feel welcomed and supported. We offer parents the opportunity to make several visits prior to the first day of care. The precise format and length of orientation will depend on each individual family. During these visits staff will find out about daily routines and any information that may help the child to settle. The staff team prides itself on taking time and effort to ensure both children and parents feel relaxed and at home in the centre.